FME Server can be set up to send emails . The first step is to set up a topic. Since a topic is just a named channel, all this involves is giving the topic a name and description. In order for notifications published to the topic to have an effect, there must be a subscriber. We will be using an email subscriber. Go to Subscriptions > New. Set up the email subscriber. 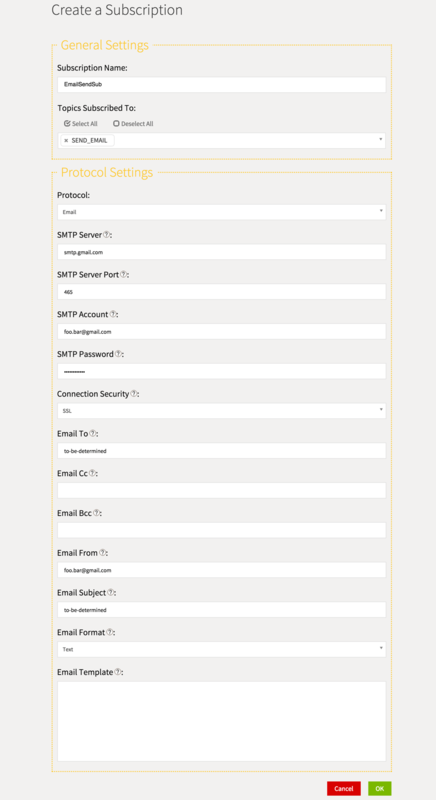 The settings shown are for Gmail, but any SMTP server can be used. Gmail does not allow you to set a from address different than the login account, but this is possible with some other service providers. To test the configuration, you can manually send the following JSON into the topic by going to Notifications > Topics > SEND_EMAIL and clicking the 'Test Topic' button. Enter the JSON in the text box under Data to Send and click OK. In this part of the tutorial, we have set up a topic and a subscriber, and sent a test email. In the next section, we will create a workspace which will send an email when it is run.